Well, well, well, Class 3! Another super exciting week in the bag! You have blown the adults away this week with your wonderful work with co-ordinates in maths - something very challenging but with resilience like yours, it was a complete success! You can now read co-ordinates, translate shapes and describe movement. Wowee! Your English has been equally as impressive, as you have been progressing towards writing your own persuasive letters to Wall's Ice-cream about their use of palm oil. Your plans are already super persuasive and emotive so I cannot wait for them to come together next week in your full letter. To top it all off...Red Nose Day! 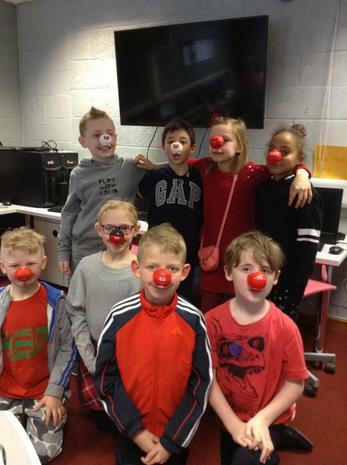 It was great to see you getting into the spirit of things with your red clothes, accessories, and of course your noses Here's a lovely snap of some of you with your noses!